When Zoe Harper wins a coveted place in a televised cookery competition she's thrilled. It's a chance to cook her way to fame and fortune and the little delicatessen she's set her heart on. The first task has hardly begun when she finds herself with rather too much on her plate. Not only has she got to contend with the fiercely competitive and downright devious Cher, but she's fast developing an inconvenient crush on one of the judges - the truly delicious Gideon Irving. All too soon there's more than canapés, cupcakes and cordon bleu at stake. I have recently finished Summer of Love by Katie Fforde which I loved and so when I got the chance to read her latest book Recipe for Love I jumped at the chance. Katie is back again with her beautiful cosy writing style which instantly draws you into the story. I am sure most of you are familiar with Katie Fforde’s work but for any of you who have yet to read one of her books let me explain that Katie’s writing style is like a massage in writing form! What I found different with this book compared to her previous books is that it had more of a modern feel to it and with this it brought different characters. For the first time in Katie’s books there was a character I did not like from the word go and that was Cher. This wasn’t a problem as her character is not meant to be liked after the situations she put Zoe in but she really did grate on me and I just wanted to shake Zoe and get her to stand up for herself more as I am sure most people would in her situation. Zoe was a very warm and caring character and would do anything to help other people even if it meant putting herself in risky situations. I also loved the character of Gideon the judge although I did find him very similar to some of Katie Fforde’s previous male characters but it’s that age old saying if it’s not broke don’t fix it! The storyline was something completely different to the authors previous books with the whole cooking competition which is what gives it a more modern feel but not to worry if any of you are like me and love the cosy country setting that Katie usually creates as there is still a good helping of this throughout the book. So yet again our Queen of cosy chick-lit provides us with another must read. 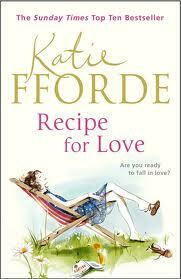 Thank you Katie Fforde let’s hope it’s not too long for the next book!